Mini Cat Ring, Snow Fairy Products, Lula Issue 15, Embroidered Cutout Shirt, Frankie Issue 50. How adorable is the TopShop shirt? It could easily be dressed up with a tailored skirt, a floaty skirt or even worn dressed down with denim cutoffs. I love this colour for summer as well as blush pink. Collared shirts also earn extra bonus points in my books. 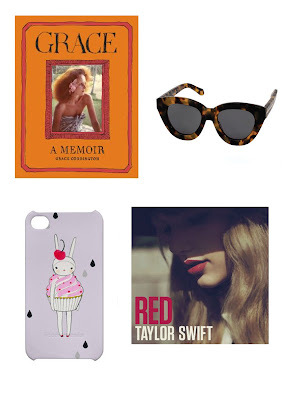 Grace: A Memoir, Anytime Crazy Tortoise Glasses, Cupcake iPhone Case, Red Album. Summer is definitely the best time to read & listen to new music & watch DVD's in bed as the sun rises. I cannot wait to read Grace Coddington's memoirs & Kirstie Clements' (Former Vogue Aus Editor) + Alexa Chung's next year. -What essentials/necessities do you want for Summer? Leave a comment below & you could win a prize pack! Check my Facebook page later today to see a photo of what you can win. This competition is now closed. Open to Australian & NZ Residents only. *You must have liked my blog page to be eligible for entry (click the link above). Ooooh! Competition! Hurrah! My Summer essential this season is my Benefit lip tint; perfect as it stays on while swimming so I can have pretty ruby lips and cheeks when taking a dip. I want a newer iPhone, with a better camera and longer battery life to capture the fun we're going to have this summer, I want a couple of gorgeous swimsuits (Seafolly have some supercute ones)for our Samoan holiday, some of the gorgeous bejewelled sandals from Forever New and a new wallet (yet to be discovered). My Summer wishlist includes: Pink's The Truth About Love album,some new swimwear (amen to Myer opening in my hometown next week!! ), beach visits, cool lime softdrink and family! (plus Frankie mag and Vogue!)! YAY for a giveaway :) Would totally make my stressful week all the worthwhile! Great Blog! and great competition. All I want is nice times with my friends! But I wouldn't say no to a perfectly tailored lightweight western shirt. My fashion wishlist for this summer is a fancier interpretation of my every-summer getup of cotton, denim, togs, kicks & sunnies: Comme des Garcons blue-striped cotton shirt with bowtie, cut-off denim shorts, Zimmermann navy cross-front swimsuit, JW Anderson for Topshop t-shirt, Karen Walker Harvest pink sunglasses, Feiyue white canvas sneakers, and a Karen Walker octopus blue velour beach towel. I'd also be very happy with (and more likely to get) my real summer must-have: a week spent camping at a Far North beach! I'm fairly basic when it comes to summer: my staples include a new pair of Haviannas, a bright and cute summer dress, Soft Lips lip balm in a summer edition flavour, a bottle of strawberry-lime flavoured Rekorderlig and most importantly non-stop plans with the loved ones.